Car S.O.S presenters Fuzz Townshend and Tim Shaw have opened a new exhibition at the British Motor Museum, in Gaydon, Warwickshire, featuring cars from the popular National Geographic TV show Car S.O.S. The show is now in its sixth series and has restored more than 60 cars, from family classics to hot hatches and sports cars, for owners who for various reasons have been unable to complete them. The new exhibition features seven cars that have been rebuilt by the Car S.O.S team including three from the most recent series – a pre-war Austin ‘Tilly’ truck, a yellow Lancia Delta Integrale and a rare AC Aceca. The others four are an MGA, Volvo P1800, Aston Martin DB6 and a Ford Capri RS3100. Graphics and clips from the relevant episodes run alongside each of the cars detailing the challenges faced by Tim and Fuzz during the rebuilds, and the personal stories of the cars' owners. 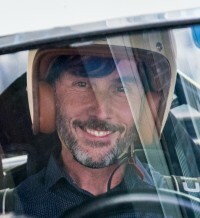 The producer of the series Stephen Taylor Woodrow, said 'The Car S.O.S team are over the moon with the exhibition – we get so many requests from viewers asking where they can see our cars so this really is a perfect opportunity. The fact that the exhibition is at the British Motor Museum makes perfect sense – having been at the venue for two of our reveals, we have built up a good relationship with the team there and knew the cars would look amazing. The show’s presenters were joined by the car’s owners, friends, family and production crew, as well as the Car S.O.S workshop team for a private opening. The Car S.O.S Exhibition is now open until the end of February 2019 and is included within the Museum entrance fee. Museum admission is charged at: adults £14, children £9 (5-16 years) under fives free, concessions £12 and family £39 (two adults & up to three children). Buy one day and get 12 months free if you Gift Aid your entrance. To find out more about visit the British Motor Museum website or call +44 (0)1926 641188.